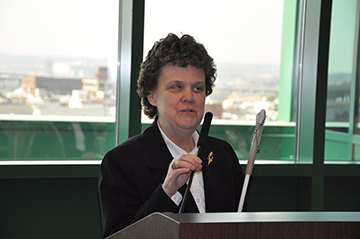 From the Editor: Patricia Maurer serves as director of community relations for the National Federation of the Blind. One of her passions is her work with the NFB’s Early Childhood Initiative, through which the NFB reaches out to the families of young blind children. Those of you who know me know that I have worked at the National Federation of the Blind for thirty years. If you are acquainted with my story, you know that I am blind and have been blind all of my life. From my early years through high school, I lived in Dexter, Iowa, where I attended the public schools. During that time I depended on my teachers, family, and fellow students to read my textbooks and schoolwork to me so I could obtain the information I needed. I did utilize Talking Books, but these books generally did not help me with my school reading. Although I had vision of 20/400 in both eyes, I did not know about traveling with a cane. Most of the time I followed other people, hoping that I would not fall over steps, curbs, or other obstacles. I believe my parents explored the school for the blind as an option for me, but they did not want to send me three hundred miles away from home. At that time there were no other alternatives that would allow me to learn the skills of blindness. When I was in my mid-teens, I saw a commercial about the National Federation of the Blind. I got on the phone and spoke with Dr. Kenneth Jernigan, who was the director of programs for the blind in Iowa. It was the year before he became president of the National Federation of the Blind. Dr. Jernigan urged me to come to Des Moines to learn Braille and cane travel skills. He found a way for me to receive Braille instruction and cane travel during that summer so that I could finish high school with my brand-new skills. Fast forward to today. I am now trying my best to pay it forward and give families the kind of start that Dr. Jernigan gave me years ago. Our Early Childhood Initiative Program at the National Federation of the Blind gives families and their young blind children a rooted start—a start in early Braille skills, a start in cane travel, and a start in the Federation. These roots grow and blossom into our next generation of scientists, teachers, senators, and NFB leaders. Through the NFB Early Childhood Initiative Program, families receive information and strategies for developing their children's skills in Braille and cane travel. The Early Childhood Initiative has two components: the NFB Braille Reading Pals Program and the NFB Early Explorers Program. All participants in either program receive a subscription to Future Reflections, our quarterly magazine for parents and teachers of blind children. They also receive a subscription to The BEE, a monthly e-newsletter, also directed to parents and teachers. You can enroll in both programs online at https://nfb.org/nfb-early-childhood-initiative-program. Through the NFB Early Explorers Program, children can apply for a free long white cane if they do not have one already. Families will receive a variety of articles from past issues of Future Reflections that relate to cane travel as well as a flyer regarding the book Independent Movement and Travel in Blind Children: A Promotion Model by Joe Cutter. In addition, participants will be sent an informational DVD and the special issue of Future Reflections, Travel and Independence. Participants in the NFB Braille Reading Pals Program will receive a plush "reading pal," a print/Braille book each year they are enrolled in the program, a Braille birthday card in the month of their birth, and quarterly activities in print and Braille for children and parents to work on together. They will also receive the special issue of Future Reflections, The Early Years. Reading Braille and walking with a long white cane can become part of the child's daily life, and he or she will begin to gain confidence and independence from an early age. Parents will understand that with love, hope, and determination, their blind children can flourish and live the lives they want!